Have you ever made shamrocks out of hearts? We have been enjoying doing some simple scissor skills activities lately with my preschooler to strengthen her fine motor skills and she wanted to make a shamrock! I thought cutting out an entire shamrock sounded really hard, but breaking it up into little steps using hearts was totally do-able. 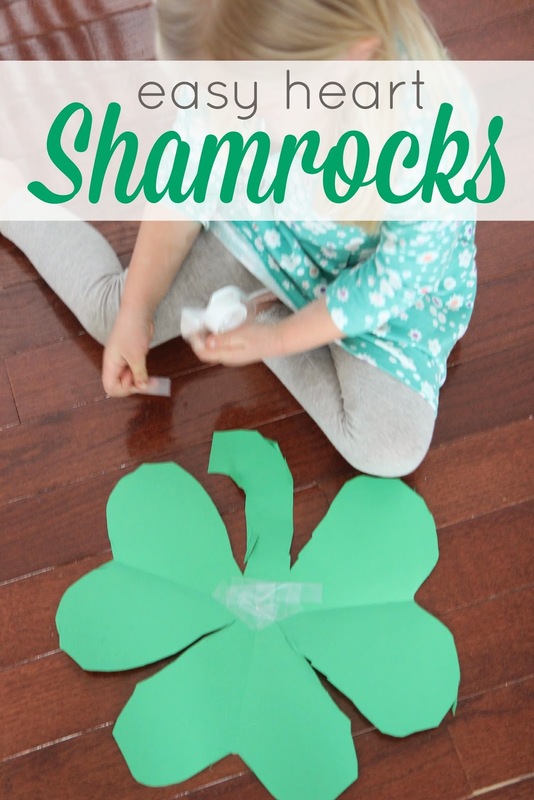 Today I'm going to share how we made an easy heart shamrock craft and I'll also tell you about a few other favorite shamrock crafts we've tried out or have on our list to try out this week! This craft is so simple that it only needs four things. First I folded over three pieces of green paper and drew 1/2 heart outlines on each of them. Then my daughter grabbed her scissors and cut along the lines for each paper and then opened up the papers to reveal a heart on each of them. Next I drew a simple stem and then my daughter cut it out. After that we used some tape to tape all of the pieces together in the center to make our big shamrock. My kids love tape, so this activity was a hit. They love to cover their projects with as much tape as possible. Once everything was taped together my daughter held up her papers to reveal her giant shamrock! She was so proud that all of her cutting skills made her such a large and beautiful creation. Have any other favorite shamrock crafts you can share with us? Made these with my daughter yesterday... we used big fluffy pipe cleaners for the stems. She made quite a few, her dad even got one to take to the office!